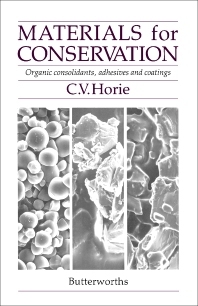 Materials for Conservation: Organic Consolidants, Adhesives and Coatings provides an overview of one aspect of materials conservation treatment, particularly the properties of organic consolidants, adhesives, and coatings. The contents of the book are divided into two parts; these parts are background information and survey of polymers. The coverage of the first part includes polymer science and the uses and requirements of applied polymers. The second part covers resins, vinyl, thermoplastics, fillers, and colorants. The text will be most useful to individuals involved in the management and conservation of historic materials, such as museum curators. Materials engineer and polymer chemists will also benefit from the book. Appendix 2.2 Some Representative Hydrocarbon Solvents Derived From Petroleum by Distillation etc. Velson Horie is a strategic planner with an international reputation in project management, research, and teaching. After a degree in chemistry, he trained in archaeological conservation at the Institute of Archaeology (London) where interest started in polymers and their use in conservation. As an archaeological conservator in the north-east of England, he pioneered the use of environmental control and the integration of conservation ideas into wider museum concerns. For 28 years he was Keeper of Conservation at The Manchester Museum, The University of Manchester, then was the Research Project Manager at the British Library coordinating an international and interdisciplinary study on the natural ageing of books. He has carried out conservation, research, and professional coordination primarily with organic materials, such as polymers, preserved animal skin, movie film, and degraded wood. He project managed and delivered a wide range of projects, from collaborative research to professional accreditation to a £21m capital development. All required, and benefited from, multi-disciplinary teams, focussed on quality improvements with clear public benefits. Teaching experience includes university lectures, a distance learning course on Chemistry for Conservators and professional updating courses on polymers, most recently involved with the design and delivery of a course Adhesives for Conservation for the American Institute for Conservation. He acts as a consultant to museums and other institutions on their development and Curatorial Advisor to the New Mills Heritage Centre. He has upwards of 80 publications and editorships, including Materials for Conservation and papers on film degradation and preservation. He is a Fellow of the International Institute for Conservation, and the Museums Association, an Accredited Conservator-Restorer, and a professional Member of the Association for Project Management. He was on the board of the Institute of Conservation and its predecessor. He is currently Treasurer of the International Institute for Conservation.